Louisville Kentucky Mortgage Lender for FHA, VA, KHC, USDA and Rural Housing Kentucky Mortgage: How much income do I need qualify for Kentucky Home Loan? The back-end ratio, also known as the debt-to-income ratio, calculates the percentage of your gross income required to cover your debts. Debts include your mortgage, credit-card payments, child support and other loan payments. 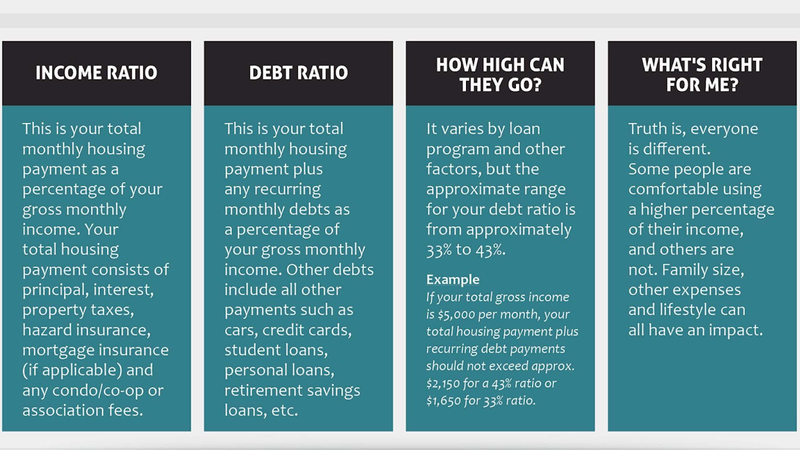 Most lenders recommend that your debt-to-income ratio does not exceed 45% of your gross income. 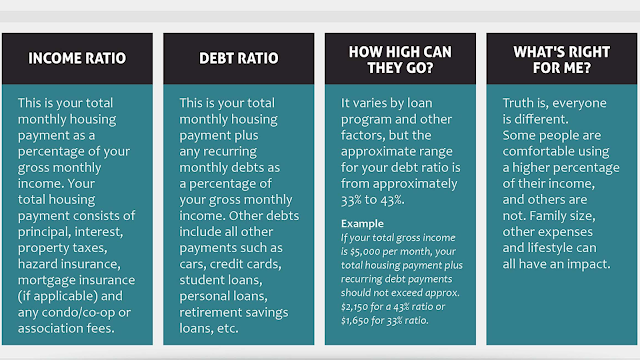 To calculate your maximum monthly debt based on this ratio, multiply your gross income by 0..45 and divide by 12. For example, if you earn $100,000 per year, your maximum monthly debt expenses should not exceed $3,750 with new mortgage payment. Utility bills, car insurance, cell phone bills, insurance payments does not factor into this ratio. Only bills listed on credit report and 401k loan and child support payments. If you are looking to purchase your first home, you have probably been doing your research about properties in your area, where you might be able to obtain a loan and how to qualify for it. A key term you may recognize from all that research is "debt-to-income ratio," which refers to the figure you get when you add up all your monthly debt payments and then divide that number by your monthly income. In laymen's terms, the debt-to-income ratio gives potential mortgage lenders an idea of how much your expenses are each month in comparison to how much you actually earn. Depending on where you are in the home-buying process, you may have a good idea of where your credit score lands. As important as a strong credit score is, however, a favorable debt-to-income ratio is arguably of equal importance, and it may be just as closely scrutinized by any potential mortgage lenders. When you try and obtain a loan, expect possible lenders to review two types of debt-to-income ratio. The front-end ratio, or "housing" ratio, gives them an idea of what percentage of your monthly income would have to go toward home-related expenses, such as the mortgage, associated taxes and any additional fees, such as homeowner's association expenditures, that may apply. The back-end ratio, on the other hand, takes a more cumulative approach and compares your monthly income to all your expenses, from the housing-related ones to school tuition, child support, car payments and any other financial obligations you may have. The exact percentage your lender will look for will likely vary based on factors such as your credit score, how much you have in your savings account and how much you have to put down for your down payment. Most standard lenders, however, prefer to see something in the ballpark of 28 percent for a front-end ratio. For a back-end ratio, they will likely look for a percentage that does not exceed 36 percent. Federal Housing Authority lenders typically look for a front-end ratio of about 31 percent and a back-end ratio that does not exceed 43 percent. Simply put, the most effective way to lower a high debt-to-income ratio and therefore make yourself more appealing to lenders is to pay off some of your debt. If you have a cosigner who may be willing to help you out with a loan, that could serve as an additional method of getting around a high ratio.